One of the most important coral building polyps, the Acropora nasuta has been discovered to call for help. You can read the actual research in the Science journal from November 8th. We know how much help bleached and wrecked corals need after global warming effects and attacks from all and sundry. Now we know how they deal with emergencies in their own way. They send out a distress call! Many mutualistic societies exist on coral reefs alone and elsewhere in the animal and plant kingdoms. This one is speedy and it works. Two species of goby, Gobidon histrio and Paragobidon enchinocephalus rush to the scene within a few minutes, like fire trucks dealing with a dangerous situation. The green menace (the seaweed Chlorodesmis fastigiata, is "mowed" and removed to a safe distance and the coral gets on with its business of growing new reefs to swim on. "These little fish would come out and mow the seaweed off so it didn't touch the coral," explains Prof. Hay, who holds the Harry and Linda Teasley Chair in Environmental Biology at Georgia Tech. "This takes place very rapidly, which means it must be very important to both the coral and the fish. The coral releases a chemical and the fish respond right away." Over three days the seaweed declined by 30% in the area, while coral damage decreased by a corresponding 75%. What a great relationship. The fish get protection of course. 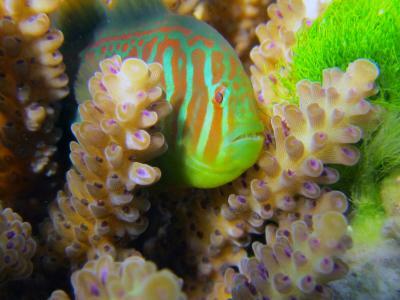 Any predator trying to catch the short policemen is deterred by the intricate patterns of the coral where they hide plus the gobies become more toxic to eat themselves because of their meal! A control experiment where corals had no gobies resulted in badly damaged coral. Fish also responded to the seaweed extract, yet did not come simply when the seaweed was present. This is the first time Danielle Dixson who is a post-doctoral fellow and Prof. Mark Hay of the Georgia Institute of Technology in Atlanta, or anybody else, have researched such an emergency response. A consumer species here reacts to a chemical signal just like a pheromone response in, say, ants. The competitive seaweed is removed by the mutual relationship between the fish and the coral polyps. Perhaps the whole reef benefits from relationships that have built up over many millions of years just like this. In Fiji, the reefs are quite protected and secure, but in many areas, there are few corals alive and no protection for the fish either. 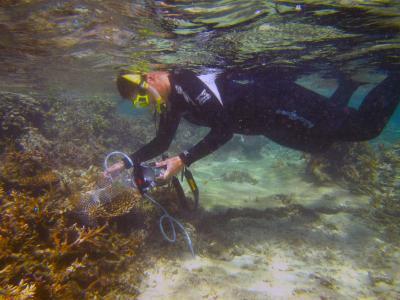 This invasive seaweed will grow over the coral and release its own toxic chemicals. Professor Mark Hay explains concisely, "This species of coral is recruiting inch-long bodyguards. There is a careful and nuanced dance of the odors that makes all this happen. The fish have evolved to cue on the odor released into the water by the coral, and they very quickly take care of the problem." And before you ask, Nemo is a clownfish who lives inside an anemone, while the goby (there is one in, "Finding Nemo") lives in and protects the coral. Totally different!